The engine room at Westhorpe Colliery. Any names please. Photo courtesy of Mrs A Staples. Ron Woodward ended up catch pulling in the pit bottom. At the time the onsetter was Mick Hagin (who retired to Skeggy) I was making sure the coal tubs ran smoothly from the loader to the shaft (bloody cold in winter). On the loader was Joe Hall. His assistant was Harry Keeley (very pleasant chap as anyone who knew him will agree). On the bunker was Len (the pink panther) Smallshaw. The pit bottom deputy was John Redfern (my dad’s uncle). Ron Woodward did drive for Bootheys as one day we were catching the school bus from Westfield School Mosborough and he did’nt let me on so I ended up walking home. Needless to say I brought it up a few times. 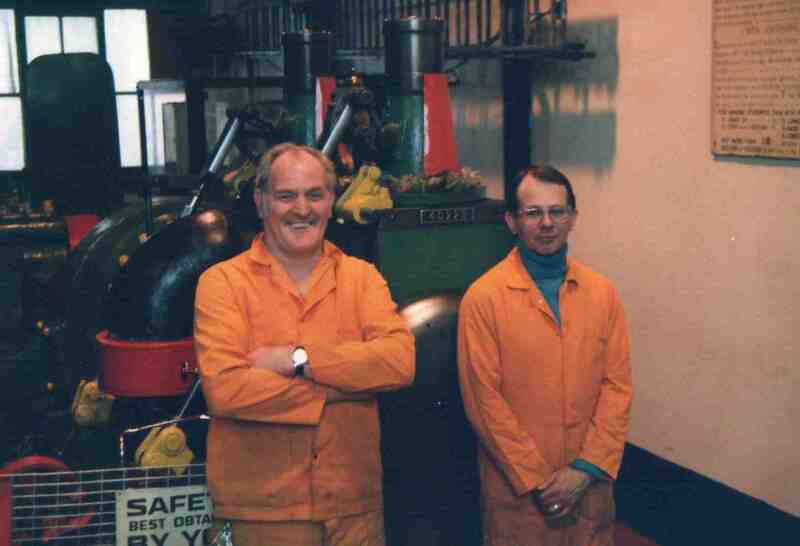 The man on left of photograph is Mr Willoughby and on right is Ron Woodward who worked for Booth and Fisher.